This is an English and Devonshire locational surname. 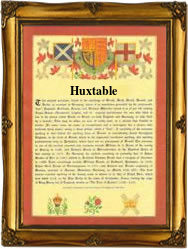 It originates from a place called Huxtable, believed to have been in the environs of the town of Barnstaple, with which it shares a suffix. We have not however been able to clarify the exact site. The famous Victorian etymologist Canon Charles Bardsley writing in the year 1880 says that 'it (Huxtable) is a local surname and is much recorded in the Barnstaple district', which indeed is true. Almost all early church recordings are to be found in North Devon. This is unusual because locational surnames were usually 'from' names. That is to say names given to people after they left their local area and moved somewhere else. However as Huxtable seems to have 'disappeared' very quickly, nornal rules may not apply. The name means 'The boundary pole on the ridge' from the Olde English pre 7th century 'hyrcg-stapel', whilst Barstaple is believed to mean 'The mooring place of ships' with 'stapel' in this case having a transferred meaning of a mooring, which may have been a stake. Early examples of the surname recording include Agnis Huxtable, who was christened at West Down, Devon, on May 26th 1586, and William Huxtable and his wife Ann, who were witnesses at South Molton, Devon, on December 31st 1776.